With immersive and intuitive gameplay, paired with simple, but quite rewarding features, this retro pokie has established itself as one of the most popular titles in both Australia and New Zealand. Although not quite as popular in Vegas, it can still be found in plenty of casinos, especially off-strip and Downtown. 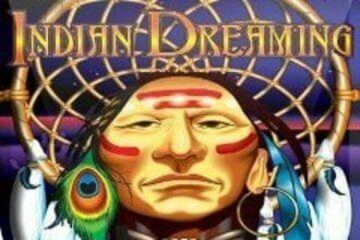 Indian Dreaming is a 5-reel, 243-ways-to win slot machine, produced in 1999. The highly popular game is themed around the vibrant culture of the Native American people, and it features the bright, colourful symbols such as tepees, squaws, and tomahawks. In addition, you will come across a Buffalo, Totem Poles, and the Chief. The latter is a very welcome sight in here, being the most lucrative one on the reels. Indian Dreaming slot relies on the quality rather than the quantity of Bonus features, so it comes as no surprise that there is very few of them included. Players will want to keep an eye on tepees as they act as Wild symbols, and, even though they are devoid of multipliers, you will certainly appreciate their presence in this 243-ways-to-win setup where they can display their true winning potential. Scatters are another big draw of the video slot, and they are represented by dream catchers that can provide you with up to 20 free spins, for landing five of them anywhere on the reels. Moreover, you can expect 3x to 15x multipliers, randomly applied to all your wins during the special round, to ultimately boost your balance. The good news is, you can re-trigger the spins, provided you land additional 3, 4, or 5 Scatters that will award extra 10, 15, or 20 free spins, respectively. The heftiest sum you can lay your hands on during the main game is whopping 9,000 coins, awarded with the help of five Chief symbols. If you are a fan of pokie slots and you have not yet played Indian Dreaming, it is one you should definitely try out. Here, our free version can be enjoyed without any need to download software onto your computer and we will never spam you with pop-ups.